Lead and Follow! Who is in the Lead? Some people find it naturally easier to lead; others prefer to follow. 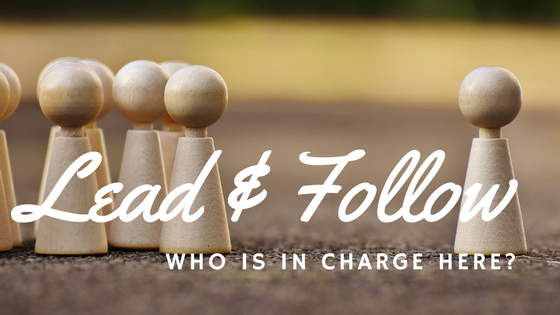 Whether we lead or follow, the question arises “Who is the leader here?” Without followers, a leader isn’t leading; without a leader it is difficult to know who to follow. I introduced a practical exercise to a group of children learning worship dance. First a leader was chosen. Each child faced the leader and mimicked the lead dancer’s movements. After a couple of minutes the leader became a follower designating the next dancer as the new leader. Around the circle we went. Everyone had opportunity to lead; all attempted to follow. Then I asked what was difficult about following. If we are honest, we too would acknowledge similar problems when leading and following. Whether we articulate it or not, we want leaders who are safe and predictable! Jacob had connived his brother out of his birthright and his blessing. Then, fearing for his life, he fled to the far side of the known world. God met him in his running. In a dream, he saw angels ascending and descending a stairway to heaven. “I am the Lord, the God of your father Abraham and the God of Isaac. If my thoughts and prayers were publicly exposed to scrutiny, they would appear just as self-centered. If God will be a safe God, a me-serving God, ensuring my comfort, provision and care, then I will worship and follow Him. Jacob wasn’t ready to give up the lead, until God proved He was good! How do you follow a leader you cannot see? That was Peter’s predicament! Just a few short years prior, Peter made the choice to “leave all” and follow Christ, even when leaving meant passing up the greatest windfall catch he had ever seen. Peter was a natural leader. For three years, his leadership training took him through unfamiliar territory of following Jesus. Just when he was beginning to get the hang of this following stuff, Jesus left. What does a follower do without a leader? The most natural leadership Peter knew was from a fishing boat. He immediately diverted to old patterns. Three years of training appeared to fly out the window, or should I say jump overboard? “Quack! Quack!” Thomas, Nathanael, James and John, plus two other disciples joined the line of would-be-deserters and followed Peter’s lead. Like it or not, a leader is always leading – for better or worse! The immense catch of fish revealed Jesus’ identity. Peter immediately jumped overboard and approached Jesus, leaving his would-be-followers alone in the boat. I have always felt drawn by nature into secluded places. As a young girl, I chanced upon a herd of white-tails. The buck sensed something alien hiding in the willow bush and advanced with nostrils flaring and antlers flinging dust in the air. I crouched breathless – unmoving! Though he could not see me clearly, he was wary. With one flick of his tail, the entire herd of thirty-or-so deer turned, springing effortless over fences and out of sight. My heart raced in the midst of unpredictable danger and wonder! Following God often leaves me breathless in heart-racing uncertainty with a combined sense of danger and wonder! I want God predictable! But ask Job how predictable God is! Or maybe Joseph! God, unpredictable? Yes! He seems unpredictable only because His ways and thoughts are brilliant and magnificent in every dimension. While He is leading the way to jagged mountain peaks, I’m content frolicking in the plush meadow. I’m know I’m not alone! Others have been caught slip-footed as He has leading them through flooded rivers, toward “invincible” armies, or into prisons and cave fortresses. Following well has always been difficult for me. I echo the sentiments of my little dancers. It is uncomfortable to follow, when I’m not sure where, how or when God is about to move, change directions, or lead toward unfamiliar terrain. Though His ways are confusing, at the least, and perplexing more oft than not, I know I can (and should) trust His lead. Why? Because I know He is indescribably good. Where He leads is for my inevitable benefit, though perhaps lacking in personal comfort. “Lead and Follow” is far more that a children’s activation exercise. I, too, am perpetually working on my step-by-step follow to my Father’s perfect lead. You see, to follow well requires complete surrender to another’s will and ways. The only way I will grow as a leader is to ultimately become a faithful follower. It is wonderful paradox! You are invited to sign up and receive blogs regularly through your email here! ← A Daughter’s Redemption! Dawn Enters a New Day!